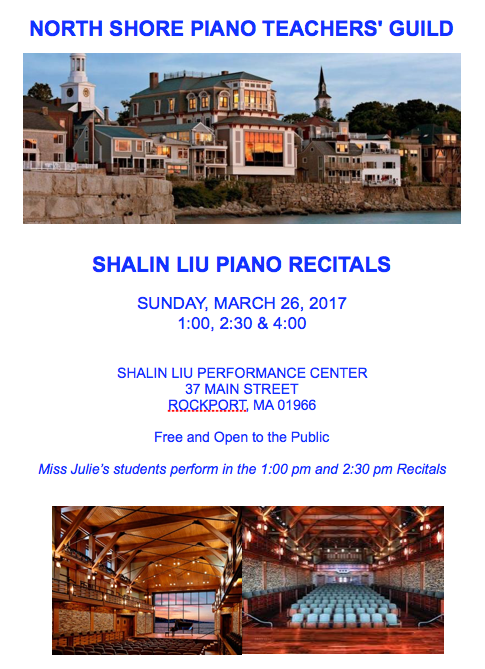 This Sunday, five of my piano students will be performing as part of the North Shore Piano Teachers’ Guild Shalin Liu Piano Recitals event this Sunday, March 26th at the Shalin Liu Performance Center in Rockport. Piano students of piano teachers from around the North Shore come together in one afternoon of piano performances, from beginning students through advanced players. Two of my students will be performing in the 1:00 pm recital and three will be performing in the 2:30 pm recital. Here’s a clip of one of my students (she’s in the 2:30 recital), working on her piece from our lesson this week.